Plot Summary: Located alongside the Tennessee River, Muscle Shoals, Alabama is the unlikely breeding ground for some of America’s most creative and defiant music. Under the spiritual influence of the “Singing River,” as Native Americans called it, the music of Muscle Shoals has helped create some of the most important and resonant songs of all time. At its heart is Rick Hall who founded FAME Studios. Overcoming crushing poverty and staggering tragedies, Hall brought black and white together in Alabama’s cauldron of racial hostility to create music for the generations. He is responsible for creating the “Muscle Shoals sound” and The Swampers, the house band at FAME that eventually left to start their own successful studio, known as Muscle Shoals Sound. Greg Allman, Bono, Clarence Carter, Mick Jagger, Etta James, Alicia Keys, Keith Richards, Percy Sledge and others bear witness to Muscle Shoals’ magnetism, mystery and why it remains influential today. 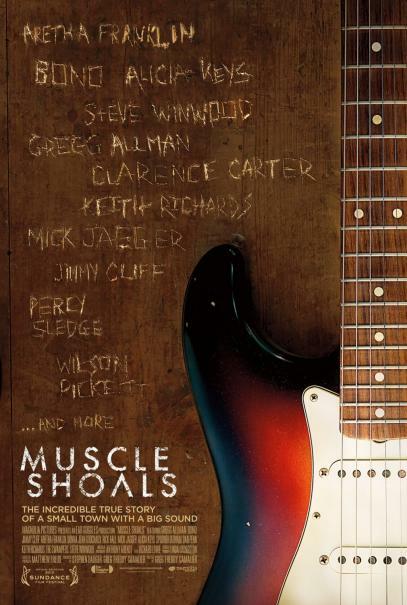 Have you ever heard of Muscle Shoals, Alabama? Let me rephrase the question – have you heard an Aretha Franklin song? Have you ever grooved to Wicked Wilson Pickett’s Land of 1000 Dances? Have you ever thought “Yes Percy Sledge, that is EXACTLY what happens when a man loves a woman!” Have you ever driven way to fast while the Rolling Stones’ Brown Sugar blasted through your speakers? If you answered yes to any of those questions, then you have heard of Muscle Shoals, Alabama or at least you’re heard the Muscle Shoals sound, the subject of the documentary Muscle Shoals from director Greg ‘Freddy’ Camalier. In the interest of full disclosure, these are my people ya’ll! I grew up just east of Muscle Shoals, also on the banks of the Tennessee River – “The Singing River” to the Native Americans who made their home there for millenia before Rick Hall founded FAME studios. Driven by a need to escape the crushing poverty and overwhelming tragedy that befalls him, Hall is the central figure in the story of the famed “Muscle Shoals sound” – well him and a group of homegrown, white as cotton studio musicians known as the “Swampers”. These men shaped what ultimately proved to be some of the finest rock, soul, and R&B America would ever produce. Music docs can really go either way, depending on such bureaucratic mundanities as rights and clearances. Muscle Shoals is a triumph, though. All personal bias aside, present day interviews with music luminaries, expertly deployed found footage and stills, and the greatest soundtrack a movie could hope for, all make Muscle Shoals one of the finest music documentaries you’ll ever see. Let the participation of such bright lights as Aretha Franklin, Wilson Pickett, Mick Jagger, Keith Richards, Bono, Jerry Wexler, Percy Sledge, Alicia Keys, Gregg Allman, Clarence Carter, and Etta James serve as a testament to the enduring magic that is Muscle Shoals, FAME studios, and that greasy, soulful sound. The only puzzling thing about Muscle Shoals is how this story went so long without being told. Posted in Documentary. Tagged Download Muscle Shoals Film 2013 Complete, full movie Muscle Shoals, Muscle Shoals Battle of the Year: The Dream Teamovies to download, Muscle Shoals complete movie part 1 of 9, Muscle Shoals complete movie part 2, Muscle Shoals complete movie part 2 10, Muscle Shoals download free movies, Muscle Shoals download movie, Muscle Shoals download movies, Muscle Shoals ending, Muscle Shoals film online, Muscle Shoals free download full movie, Muscle Shoals free full movie, Muscle Shoals free movie download, Muscle Shoals free movie part 1, Muscle Shoals free movie part 1 12, Muscle Shoals free movies, Muscle Shoals free movies download, Muscle Shoals free movies online, Muscle Shoals free movies online without downloading, Muscle Shoals free streaming, Muscle Shoals full movie, Muscle Shoals full movie download, Muscle Shoals full movie free download, Muscle Shoals full movie free online, Muscle Shoals full movie online, Muscle Shoals hd, Muscle Shoals hd movie, Muscle Shoals hd movie part.1, Muscle Shoals hd trailer, Muscle Shoals hd video, Muscle Shoals movie clip, Muscle Shoals movie clips, Muscle Shoals movie download, Muscle Shoals movie ending, Muscle Shoals movie trailer, Muscle Shoals movie watch online, Muscle Shoals movies online, Muscle Shoals online movie, Muscle Shoals online stream, Muscle Shoals online video, Muscle Shoals online videos, Muscle Shoals part 1, Muscle Shoals part 1 hd full movie, Muscle Shoals trailer, Muscle Shoals videos online, part 1 Muscle Shoals, Streaming Muscle Shoals Full Movie Online English Subtitle, watch Muscle Shoals, watch Muscle Shoals a movie, watch Muscle Shoals free, watch Muscle Shoals free movies, watch Muscle Shoals free movies online without downloading, watch Muscle Shoals Free Online, watch Muscle Shoals full movie, watch Muscle Shoals movie, watch Muscle Shoals movie online, watch Muscle Shoals Online, watch Muscle Shoals online free, watch Muscle Shoals online full movie, watch Muscle Shoals online movie, watch Muscle Shoals Without Survey, watch online Muscle Shoals in hindi.